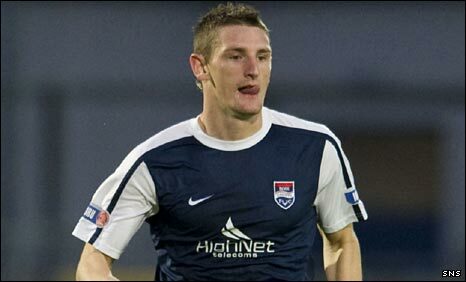 Hibernian have completed the signing of Ross County's Martin Scott for a fee thought to be in the region of £80,000. The Livingston-born midfielder, 24, has put pen to paper on a three-and-a-half-year contract with the Scottish Premier League club. Scott, often better known as Jimmy, joined County in 2006 after coming through the youth ranks at Livingston. "Hibernian is a massive club and it is a real privilege for me to come here," Scott told the Hibs website. "I'm delighted with the move and the chance to come and try to establish myself at Hibernian. "Easter Road is an amazing stadium and I'm thoroughly looking forward to the challenge and the fight ahead by helping Hibernian to get points on the board." Scott rose to national prominence with last season's Scottish Cup semi-final goal that helped County defeat Celtic. County's manager at the time was Derek Adams, who recently moved to Easter Road to be assistant boss to Colin Calderwood. Hibs are already close to completing the deal to sign Matt Thornhill should the Nottingham Forest midfielder recover sufficiently from a troublesome ankle injury. Calderwood said on Monday he was hopeful of adding another player to his squad ahead of Wednesday's match with Rangers and Scott could be in line to make his debut against the reigning champions. "I'm delighted we've managed to sign Martin," Calderwood added. "He comes into a competitive area of the team and has all the attributes I'm looking for in a player. "I think one of the first games I went to watch after I'd been appointed manager here was Ross County and I was very impressed with him. "I asked the rest of the staff about him and he was a player who was highly thought of. "I did a bit more homework on him and then when Derek joined he testified about his character and ability. "Martin is a player who will give everything every day and I'm looking forward to having him as part of our squad."